Adult shield-bug nymphal parasitoid Aridelus rufotestaceus (Hymenoptera: Braconidae) parasitizing a nymph of Green vegetable bug, Nezara viridula, (Hemiptera: Pentatomidae). 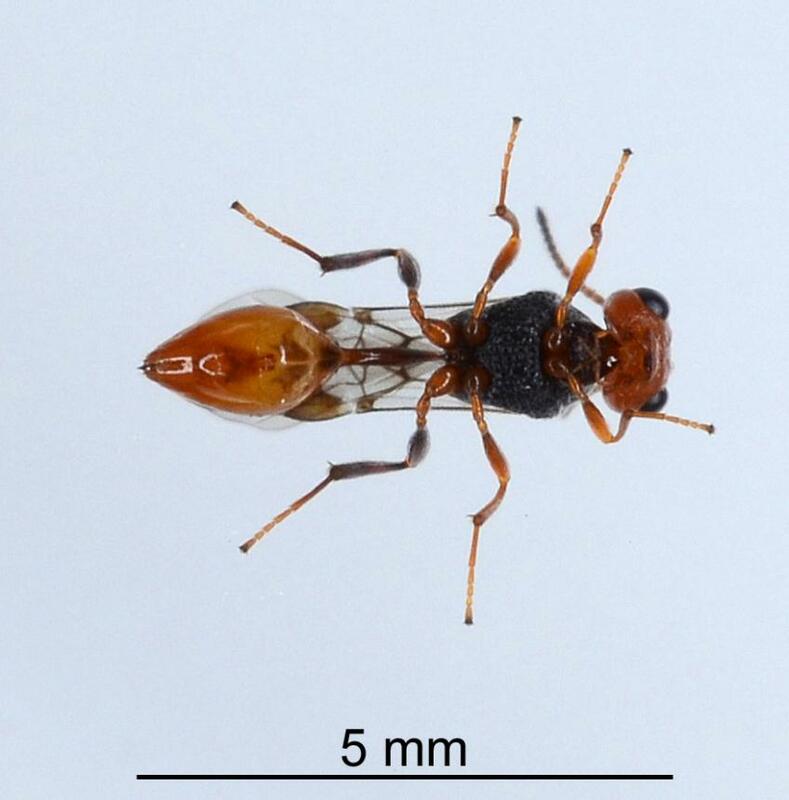 This adventive wasp was first found in Auckland in 2010 by Stephen Thorpe. In other countries it was known to parasitize nymphs of green vegetable bug, Nezara viridula, (Hemiptera: Pentatomidae). 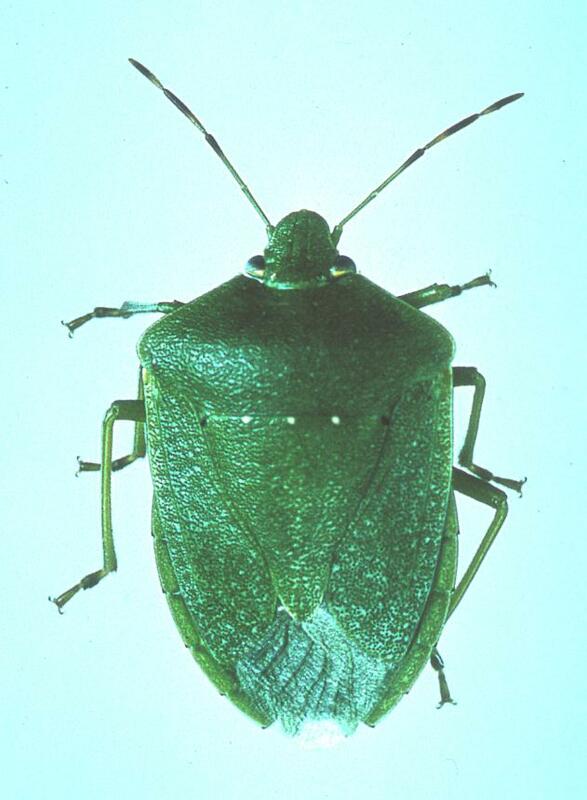 In New Zealand it has also been found to parasitize the Australasian green shield bug, Glaucias amyoti (Hemiptera: Pentatomidae). Conservation status: The wasp parasitoid has only been found in the Auckland region, but is likely to spread. It attacks both pest and native shield bugs. 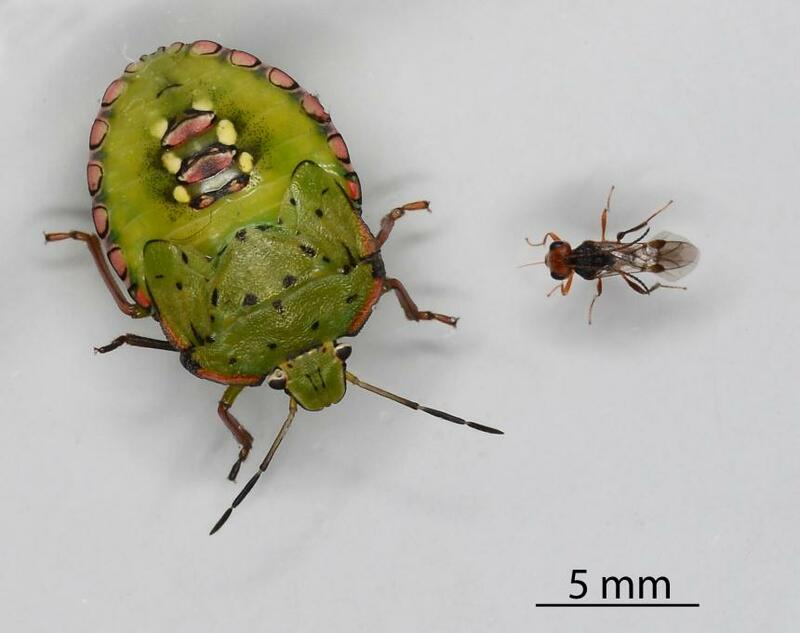 The Shield-bug nymphal parasitoid, kills nymph and adult green vegetable bugs and other shield bugs. It appears to primarily attack nymphs that are present from spring to autumn, so the species probably over winters as adults. 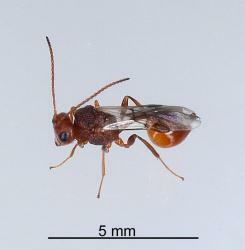 The adult wasps are about 5 mm long. 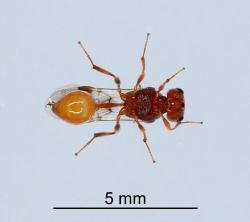 The head and body are brown and the thorax (middle section) black. The first part of the abdomen is long and narrow. They have two pairs of wings of which the forewings have strongly marked veins. 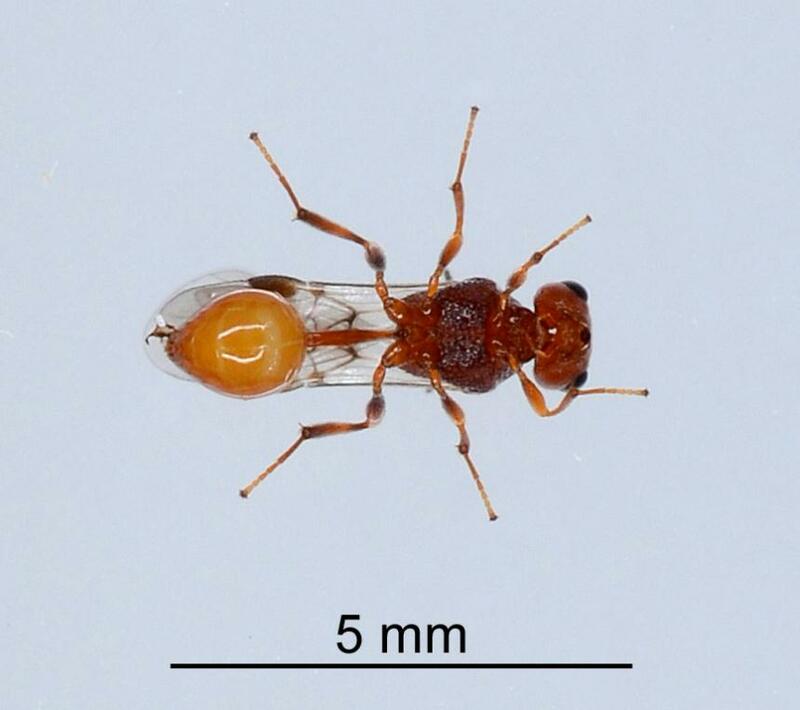 They have three pairs of brown legs and a pair of brown antennae. The male has a rounded tip to the abdomen, whereas female has a slightly pointed tip. Most of the ovipositor is hidden like a closed telescope within the bulbous end of the abdomen. 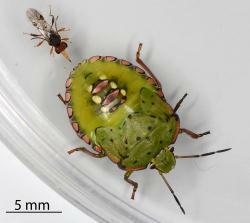 When the female wants to lay an egg in a shield bug nymph or adult, its abdomen extends forward under its thorax and well beyond its head and into the bug. The pointed tip of the ovipositor penetrates the bug and inserts an egg. It may also deposit a chemical indicating that an egg has been laid. A larva hatches from the egg in the bug. It feeds on the bug without killing it and grows to full size. The fully grown larva leaves to bug, which dies. 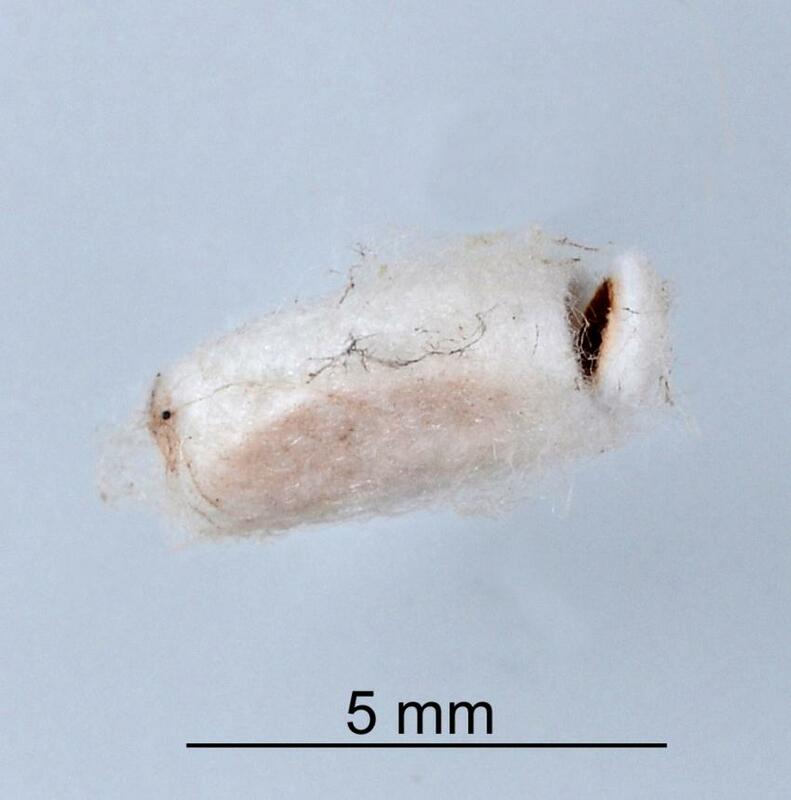 The wasp larva spins a white cocoon in which it changes into a pupa. The adult hatches from the pupa in the cocoon. When its body has hardened, it cuts through one end of the cocoon making a hole through which it emerges. 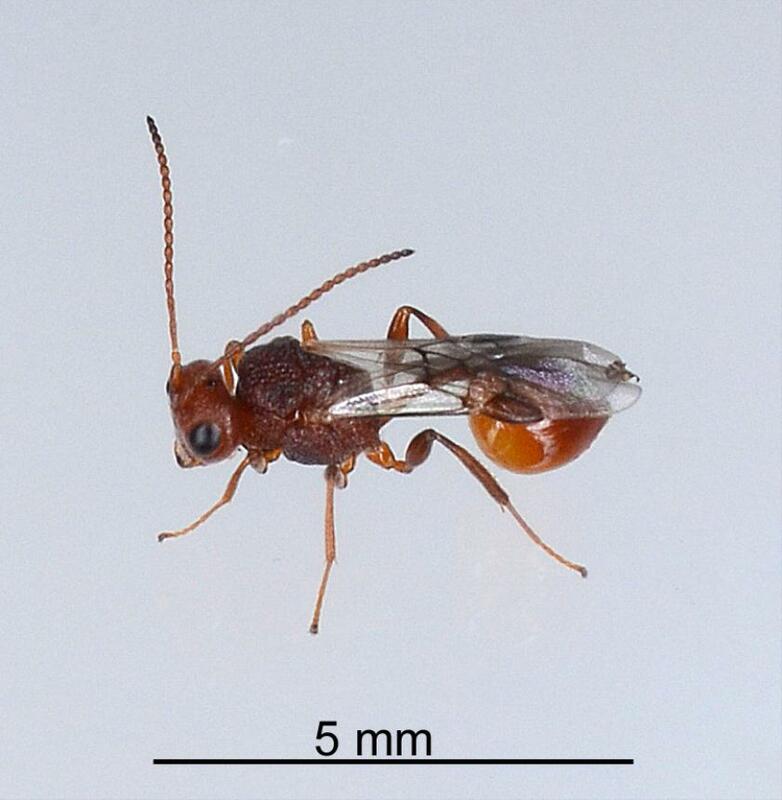 The female wasp usually spends some time following a potential victim before ovipositing. Oviposition maybe either in the rear of front of the prey. 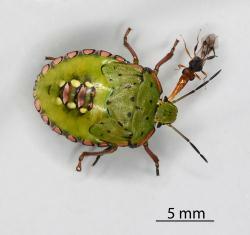 It has mainly been recorded parasitizing nymphs but can also parasitize adult shield bugs. Adult female shield-bug nymphal parasitoid Aridelus rufotestaceus (Hymenoptera: Braconidae) approaching a nymph of Green vegetable bug, Nezara viridula, (Hemiptera: Pentatomidae): note the forward pointing antennae. Adult female shield-bug nymphal parasitoid Aridelus rufotestaceus (Hymenoptera: Braconidae) approaching a nymph of Green vegetable bug, Nezara viridula, (Hemiptera: Pentatomidae): note the antennae are now laid back. 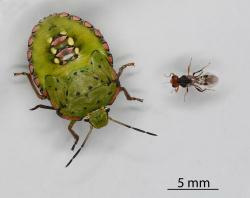 No pathogens, parasitoids or predators of shield-bug nymphal parasitoid Aridelus rufotestaceus are known in New Zealand. The adults are probably caught by predatory insects, spiders and birds. Adult female shield-bug nymphal parasitoid Aridelus rufotestaceus (Hymenoptera: Braconidae) approaching a nymph of Green vegetable bug, Nezara viridula, (Hemiptera: Pentatomidae): note the tip of the ovipositor showing in front of the head. 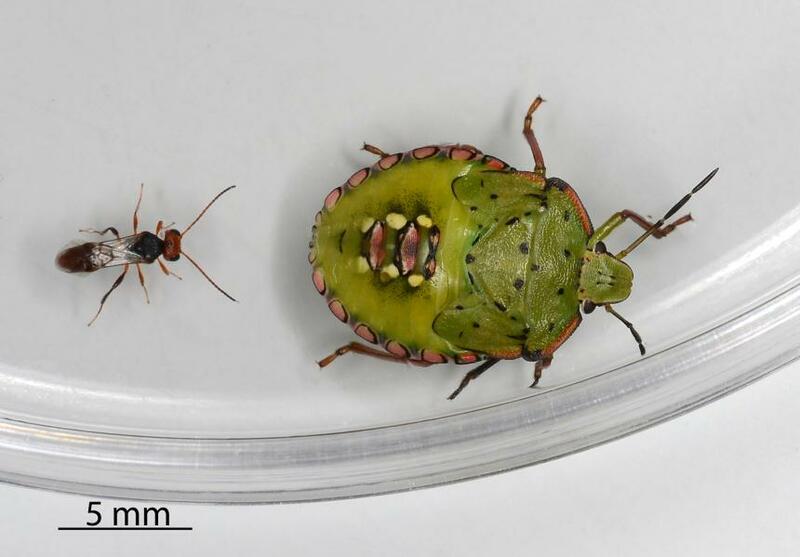 While the Shield-bug nymphal parasitoid Aridelus rufotestaceus was described and named in 1986, it was not until about 2000 that Shaw and fellow researchers in Italy discovered that it was a parasitoid of the green vegetable bug, Nezara viridula, a shield bug, (Pentatomidae). In 2016, Researchers at Plant & Food Research, Mount Albert Research centre, discovered that it had parasitised the Australasian green shield bug, Glaucias amyoti nymphs they been collected and were rearing. The female wasp usually spends some time following a potential victim before ovipositing. Oviposition maybe either in the rear of front of the prey. 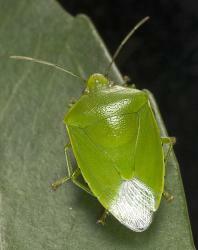 It has mainly been recorded parasitizing nymphs but can also parasitize adult shield bugs. 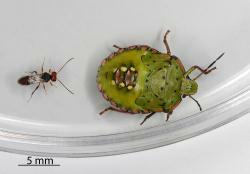 When the female wants to lay an egg in a shield bug nymph or adult, its abdomen extends forward under its thorax and well beyond its head and into the bug. The pointed tip of the ovipositor penetrates the bug and inserts an egg. 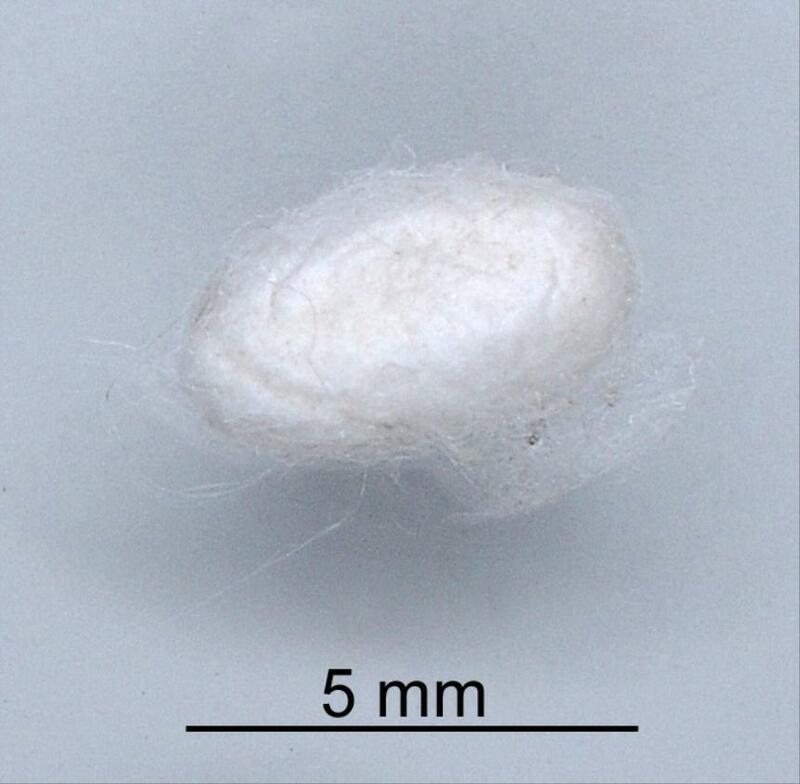 It may also deposit a chemical indicating that an egg has been laid. Table: New Zealand hosts of Shield-bug nymphal parasitoid, Aridelus rufotestaceus, Tobias, 1986 (Hymenoptera: Braconidae), from the Plant-SyNZ database (19 May 2017). The reliability score shows the quality of evidence for the host association (0-10, 10=high quality). The Shield-bug nymphal parasitoid Aridelus rufotestaceus (Hymenoptera: Braconidae) will provide additional biological control of the green vegetable bug, Nezara viridula, (Hemiptera: Pentatomidae). 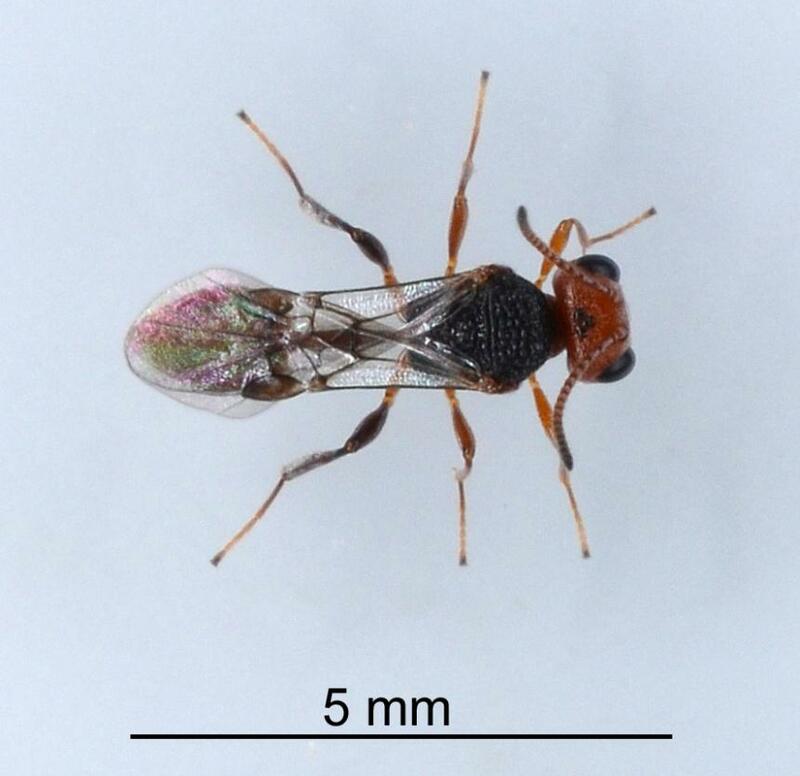 Earlier an egg parasitoid, Trissolcus basalis (Wollaston, 1858) (Hymenoptera: Platygasteridae) was released and established in New Zealand. 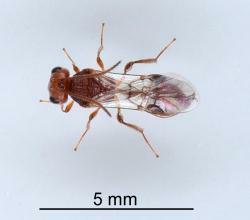 A nymphal parasitoid will provide additional help with controlling this pest. 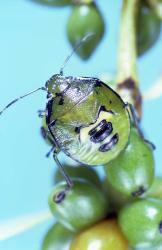 Although the benefits of the Shield-bug nymphal parasitoid for control of green vegetable bug have been known since 2001, it is unlikely to have been deliberately released into New Zealand. 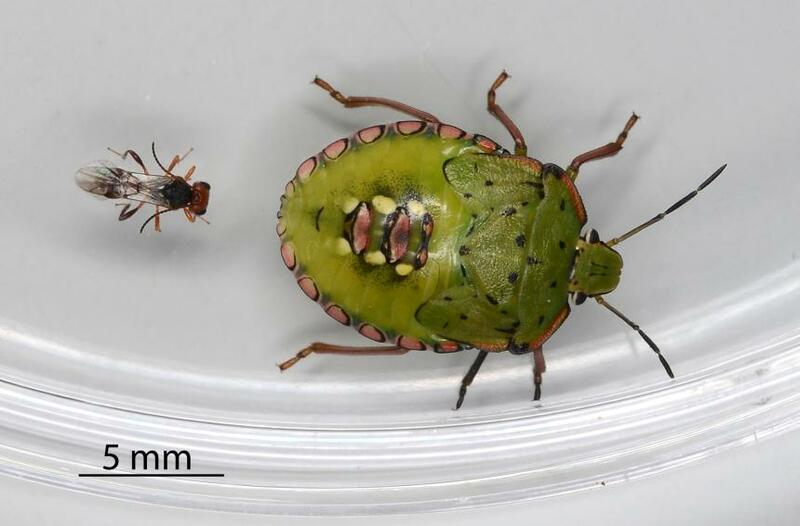 This is because, pre-release testing in Quarantine, would have shown that it could parasitize at least one native shield bug. Before an organism can be deliberately released into New Zealand, its benefits have to be shown to greatly out way the risks to native flora and fauna. Shaw SR, Salerno G, Colazza S, Peri E. 2001. First record of Aridelus rufotestaceus Tobias (Hymenoptera: Braconidae: Euphorinae) parasitizing Nezara viridula nymphs (Heteroptera: Pentatomidae) with observations on its immature stages and development. Journal of Hymenoptera Research. 10: 131-137. Sophie Hunt, Plant & Food Research, for providing the insects used to photograph oviposition behaviour. Martin NA. 2017. Shield-bug nymphal parasitoid - Aridelus rufotestaceus. Interesting Insects and other Invertebrates. New Zealand Arthropod Factsheet Series Number 95. http://nzacfactsheets.landcareresearch.co.nz/Index.html. Date Accessed. ISSN 1179-643X.